Can a hand held analyser be used to evaluate Insertion VSWR of a VSWR meter? 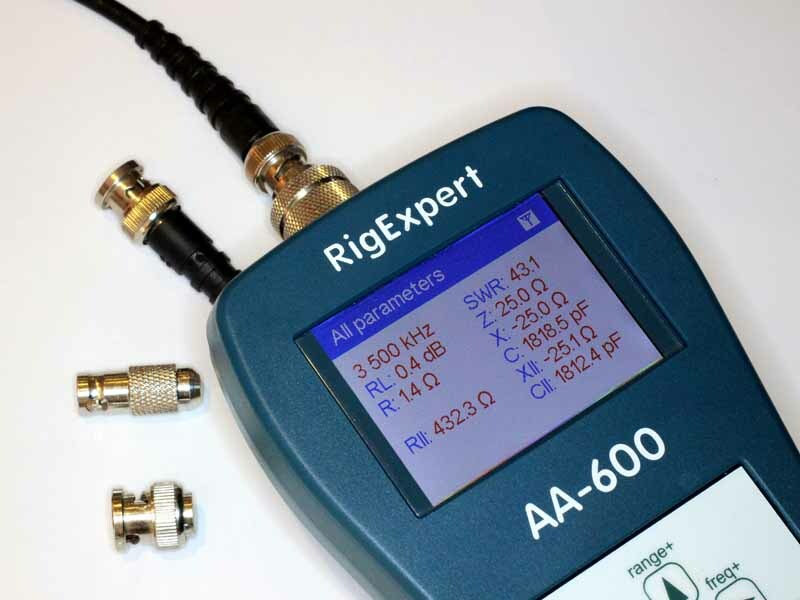 Some recent articles here used a two port analyser to evaluate Insertion VSWR of some coax switches, and it raises the question about application of a hand held analyser and Insertion VSWR of a VSWR meter. The tests here need to be interpreted in the context of whether the device under test (DUT) has only calibrated power scales, or a VSWR Set/Reflected mode of measurement, and whether directional coupler scales are identical for both directions. Repeat Test 1 at a selection of test frequencies and for each test, without changing transmitter power, reverse the DUT and verify that repeat the forward/set and reflected readings swap, but are of the same amplitude (checks the symmetry / balance of the detectors under matched line conditions). Connect a calibrated wattmeter / dummy load of the nominal impedance on the instrument output and measure calibration accuracy of power / ρ / VSWR scales at a range of power levels in both forward and reflected directions (Checks scale shape and absolute power calibration accuracy). Repeating Test 1 additionally with a calibrated VSWR meter connected to the input to the DUT, and measure the VSWR caused by the DUT at a range of test frequencies (Checks Insertion VSWR). It is not unusual for low grade instruments to pass Test 1, but to fail Test 6 (and some others, especially Test 3 and Test 4) towards the higher end of their specified frequency range. Item 6 in the list was to evaluate the Insertion VSWR. Continue reading Can a hand held analyser be used to evaluate Insertion VSWR of a VSWR meter? On a transmission line with standing waves, the voltage varies cyclically along the line, and is dependent also on power. 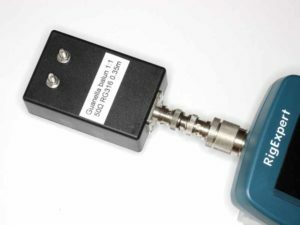 This article explains a method to use an analyser to predict the peak voltage level at a point for a given frequency and power based on measurement or estimation of complex Z or Y at that point using a suitable antenna analyser. Lets say you have some critical voltage breakdown limit and want to use your analyser to find any non-compliance at the proposed power level. Let us assume that the not-to-exceed voltage at that point is 1000Vpk. Let’s allow a little margin for variation due to factors not fixed, let’s actually use 800Vpk as the limit. We will use the maximum permitted power in Australia, 400W. A correspondent wrote about the apparent conflict between Exploiting your antenna analyser #11 and Alan, K0BG’s discussion of The SWR vs. Resonance Myth. Essentially the correspondent was concerned that Alan’s VSWR curve was difficult to understand. For convenience, here is the relevant explanation. By definition, an antenna’s resonant point will be when the reactive component (j) is equal to zero (X=Ø, or +jØ). 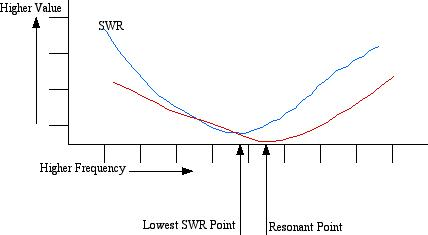 At that point in our example shown at left, the R value reads 23 ohms, and the SWR readout will be 2.1:1 (actually 2.17:1). If we raise the analyzer’s frequency slightly, the reactive component will increase (inductively) along with an increase in the resistive component, hence the VSWR will decrease, perhaps to 1.4:1. In this case, the MFJ-259B is connected to an unmatched, screwdriver antenna mounted on the left quarter panel, and measured through a 12 inch long piece of coax. This fact is shown graphically in the image at right (below). Exploiting your antenna analyser #8 was about finding resistance and reactance with some low end analysers that don’t directly display those values of interest. The article showed how to calculate the values starting with |Z| from the analyser and included links to a calculator to perform the calcs. 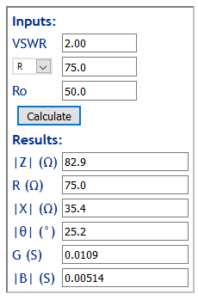 This article describes an extension to that calculator Find |Z|,R,|X| from VSWR,|Z|,R,Ro to use R, VSWR, and Ro as the starting point. Note that the sign of X and the sign of the phase of Z cannot be determined from this starting point, there just isn’t enough information. You will probably not find the equation for |X|(R,VSWR,Ro) in text books or handbooks, and the derivation is not shown here but if there is interest, I may publish a separate paper. Lets say you knew VSWR=2, R=75Ω, Ro=50Ω, what is |X|? (Varney 1958) described his G5RV antenna in two forms, one with tuned feeders, and the more popular form with hybrid feed consisting of a so-called matching section of open wire line and then an arbitrary length of lower Zo coax or twin to the transmitter. At Measuring balun common mode impedance I showed a method of backing out the effects of a text fixture using the “subtract cable” facility of Antscope software with the Rigexpert AA-600. Some analysers (including the AA-600) support SOL calibration of the instrument itself, and some support SOL calibration using the client software (Antscope in this case). This article demonstrates use of Antscope with SOL calibration to measure a small RF inductor which has similar characteristic to good Guanella 1:1 HF baluns. 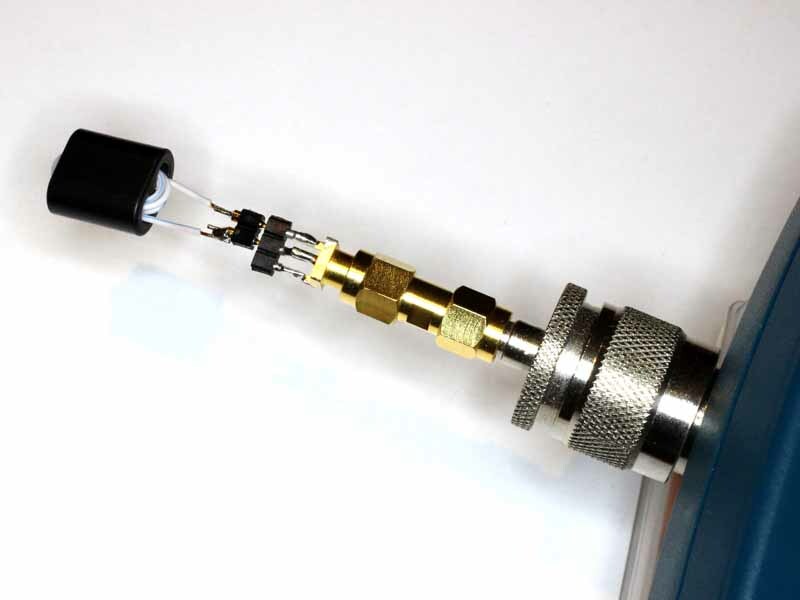 The text fixture used for this demonstration is constructed on a SMA(F) PCB connector using some machined pin connector strip, and SMA(M)-SMA(M) and N(M)-SMA(F) adapters to connect to the AA-600. In Improved cooling for the MFJ-949E I described a solution to a problem of demonstrated overheating of the ATU at rated power, indeed at a lot less than rated power. Though I have never measured the ATR-30 temperature rise, and am probably unlikely to stress the 3kW rated ATU with a 100W transmitter, I have performed a similar cooling modification to the ATR-30. At Exploiting your antenna analyser #14 I gave an explanation of the method of approximating MLL of a line section by taking the average half Return Loss with o/c and s/c terminations. This article demonstrates the technique using the Rigexpert AA-600 analyser in hand held mode. The task is to assess whether a section of RG58A/U coax has MLL at 3.5MHz similar to specification or not. The specification loss of 10.13m of RG58A/U has MLL=0.29dB.